Financing Available For All Credit Situations! HARD or SOFT TOPS Available for ANY JEEP! This 2015 Super Clean Custom Jeep Wrangler Unlimited comes equipped with Black (Linex Outter Texture Coating) Over Black Leather w/Red Stitching, Full Suspension Lift Package with 20" Moto Metal Wheels, 37X13.50R20lt Nitto Trail Grappler M/T Tires, Custom Diamond Stitched Leather Seats, Red Contrast Stitching, Large Custom Mounted Android Radio, Kicker Subwoofer, 5 Speed Automatic Transmission, Electronic Stability Control, Hill Start Assist, Trailer Sway Damping, 4-Wheel Disc Brakes, Low Back Bucket Seats, Advanced Multistage Front Air Bags, Command-Trac Shift-on-the-Fly 4WD, Next Gen. Dana 30 Solid Front Axle, Next Gen. Dana 44 HD Rear Axle, Conventional Differential Frt Axle, Auto Dim Mirror w/Reading Lamp, Power Heated Mirrors, Sentry Key Theft Deterrent System, Air Conditioning, Power Windows & Locks, Tubular Side Steps, 22.5 Gallon Fuel Tank, Steering Wheel Mounted Audio Ctrls, Power Steering, Leather Wrapped Steering Wheel, Heavy Duty Suspension w/Gas Shocks, Fuel Tank Skid Plate Shield, Transfer Case Skid Plate Shield, Max Tow Package, Hill Descent Control, Traction Control, Electronic Roll Mitigation, Hydraulic Assist Brake Booster, 5-Speed Auto W5A580 Transmission, 3.73 Rear Axle Ratio, 3.6L V6 24V VVT Engine, Remote Keyless Entry, Security Alarm, Alpine 9-Spkr w/All WeatherSubwoofer, Remote Start System, Custom DV8 Hood w/ Center Cowl, Custom Body Armor, Grumper Grill, Steel Rear Bumper with Heavy Duty Tire Carrier, LED Light Bar, Dual Steering Stabilizers, Tinted LED Tail Lights, Heated Front Seats, Steel Windshield Surround. Tow Package, SmittyBuilt Winch, Tow Hooks. This is a (2) Owner Clean CarFax Custom Jeep! 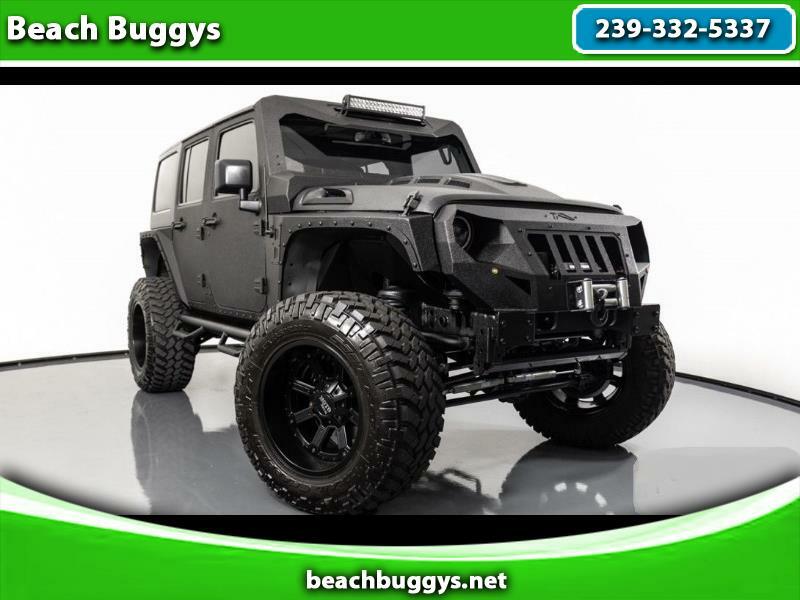 Beach Buggys Has SWFL's LARGEST Pre-Owned JEEP WRANGLER Inventory! Conveniently Located In Fort Myers at Exit 131 off I75. We Have An Array Of Colors & Custom Editions Available! Financing For All Credit Situations! Trades Always Welcome! We Specialize In Only The HIGHEST QUALITY Hand Picked 2 Door & 4 Door Jeeps! The Jeep Wrangler is the Perfect Florida Vehicle and One of the Highest Resale Convertibles Available! Proudly serving all of South West Florida including Naples, Fort Myers, Labelle, Alva, Punta Gorda, Tampa, Estero, Bonita, Everglades City, Ave Maria, Cape Coral & Marco Island. We Ship Nationwide! Come See Us Today! !